There are a lot of books and conferences and programs out there that purport to offer the “key” to spiritual growth or formation or transformation. Some are and some aren’t beneficial. Some are faithful articulations and presentations of the truth once for all delivered in Jesus Christ — the Holy Tradition. Some are based on faulty presuppositions about salvation, the Church, and growth in Christ. Some offer promises of “results” that they are not capable of producing. My dad used to say, “if it sounds too good to be true, it probably is” and “if the deal isn’t still good tomorrow it isn’t good today, walk away.” I have a kneejerk distrust of anything that combines the words “new” or “improved” with the words “spritual transformation.” (Please, before you go ballistic about that last sentence, read it again. I did not say the Body of Christ. I believe there is plenty of room for improvement when it comes to our having lost our way regarding how the Church manifests itself in the world and its internal inequities that contradict the Gospel message. Although, I must admit, I am even hesitant about the “new” as being the way forward rather than back to the integrity of the “old.”) The way of authentic spiritual transformation is never in need of improvement. There has always been a need for proverbial wisdom — the savvy of time tested fruitfulness — when it comes to embracing “programs” of spiritual formation or whatever other term happens to be used. So, how do we know what to embrace and what to walk away from on the smorgasbord of Christian approaches to salvation and growth? How do we know when an approach is really too good to be true? The answer to that question is crucial. And the answer cannot be summed up in one sentence. The answer will mean, without being overly dramatic, the difference between life and death. Israel of the Old Covenant wrestled with it. The ministry of Jesus is, in part, a story of that controversy. The story of the Acts of the Apostles involves this “thorny” question. The Seven Ecumenical Councils of the undivided Church were the story of the struggle. The Reformation was about this question. We still live with the question. WE MUST continue to live with and address this question on a personal and communal basis. We will never be off the hook. By seeking to answer this very question we experience, paradoxically, to some degree the very transformation we seek. It is the challenge of every generation in which the Gospel is being received, lived, and passed on, to preserve the integrity the authentic Way, Truth, and Life of the Christian life. To receive, live, and pass on the Holy Tradition. There is only One Gospel. The Christian life as it is designed to be lived is not a style question. It is not up for grabs. It is not ours to fiddle with because “our generation is different and needs something fresh.” It isn’t broke and does not need to be fixed. But, there are some programs and approachs that are broke and need to be run away from at all cost. I received my regular article from Imago Dei, authored Rob Des Cotes, the director of Imago Dei, an ecumenical network of Christian faith communities based in Vancouver, British Columbia, with sister groups in other locations around B.C., across Canada, as well as in other countries. It is good to be reminded often in the spiritual life that “all that glitters is not gold.” If this proverb is true for miners, it applies even more to the diversity of spiritual teachings that surround us, where there is always plenty of glitter to catch the eye. Anyone who listens to seminars, watches videos, or reads books on contemplative prayer will know that there are many strange bedfellows among us offering a cornucopia of “ways” to a deeper experience of God. All the more is it important to ask ourselves some very exacting questions regarding these “ways.” What is the ultimate goal and source of their encouragement? Do they properly represent the Way of Christ, or am I being attracted to what is being said simply because it sounds reasonable? Or worse, is it because it appeals to my vanity and ambition to be a “spiritual” person? As Paul warns Timothy, we can easily deceive ourselves by gathering a great many teachers around us to say whatever our itching ears want to hear (2Tim. 4:3). There are subtle ways by which we can be led by spiritual pride rather than by the truth of God’s disarming spirit. Perhaps the best way to discern if this might be the case is by the effect the teaching or insight has on us. If, for example, our spirituality seems to aggrandize us it is probably a good indicator that we are not following the poverty of Christ. It is more likely pride that is leading us to what St. John of the Cross calls “spiritual gluttony.” We are pursuing the satisfying “taste” of spiritual experiences more than the real nutrients of spiritual transformation. If, however, we feel that we are being undone, purged and humbled by God’s Spirit it is more likely the promised effect of Christ on us. As unattractive as this might appear to our spiritual vanity, it would be dishonest to suggest that the Christian spiritual life leads anywhere else. We are counselled in the Book of Proverbs to not lean overly on our own understanding (Prov. 3:5). This particularly applies to spiritual matters, where we must be especially diligent to remember that “all that glitters is not gold.” Just because something seems true or profound doesn’t necessarily make it so. It could just as easily be a “way that seems right unto man” but which, in the end, leads to a false foundation (Pr. 14:12). The apostle John tells us that we are to test the spirits, to ensure that they freely confess* the name of Christ. And we are to eliminate, or at least hold at bay, teachings that seem to be trying to circumvent this confession. Each of us must pass through the eye of the needle, which is the cross of Christ, in order to enter God’s kingdom. And, as Jesus taught us, heaven will surely recognize the vanity of any attempt to avoid or bypass this narrow gate. It will expose its falsity as the counterfeit spiritual direction of thieves and robbers that it truly is (John 10:1). There are no shortcuts or instant answers. I find that I need to stop quite often and ask myself if that amended statement applies to me. How often do I write and speak about living in a certain way or responding in a certain way instead of actually living and responding in that certain way? How often is my life taken up by observing rather than participating? I have a little plaque in my home chapel shelf with a quote from Thomas Merton that reads, “The saint preaches sermons by the way he walks and the way he stands – the way he picks things up and holds them in his hand.” I believe the saint preaches sermons by the way he walks and stands and listens to and with others – the way he invites others into his life and holds them. The Holy Grail is not found in books or blog posts but in the midst of the journey for it with others who seek it. The Grail is Christ. He is present and not only findable but possess-able in those with whom we journey and those we encounter as we journey. 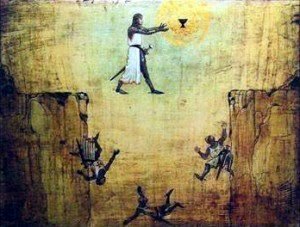 The saint is not one who seeks the Grail but the one who in the seeking is always finding it (Him), possessing it (Him), and drinking deeply of its (His) life-giving water and yet continuing to seek it (Him) and offering it (Him) to others who thirst. Lord, grant me continued repentance and the visitation of your mercy. Make me a saint and not just a person who talks about sainthood. Amen.